Buyseriousgames.com is a brand new online shop dedicated to Serious Games applications, platforms and toolsets, with a straight forward value proposition: becoming the Definitive Serious Games Reseller. Buyseriousgames.com is also a hard evidence that Serious Games Exposed is delivering on its promises of Mapping The Serious Games Industry Within The UK and devising how the UK fits into the worldwide perspective. 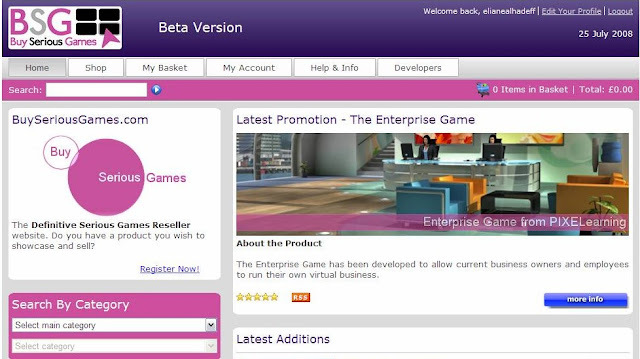 The facility allows developers to join the Serious Games Institute Community at http://www.seriousgamesinstitute.co.uk/ and to maintain their products in the Buyseriousgames.com catalogue. The site is currently in Beta version. As from September, content and games shall be added up, starting with the existing database. All developers are invited to take up the opportunity to include their products and avail themselves of the excellent opportunity for global exposure. Particular emphasis is being given to the inclusion of developers who do not have a website. Buyseriousgames.com will sell the products as a reseller and deposit the agree sums to respective bank accounts through automated bank transfers. Shaping "Serious Games" from a movement into a viable and growing market, requires new business models that accommodate new ways of doing business, and raising capital, distributing, and selling product. Buyseriousgames.com could be a head start.